Featuring the Marvel Comics debut of the Super Heroes called Wave, Aero, and Sword Master, the story sees Amadeus Cho reassemble his "protectors" to save the world from incineration. Cho has successfully led a ragtag team of heroes to defend the Earth from an alien invasion in the past, but can he do it again this time? Nice to finally see some significant Asian representation at Marvel. And in case you're wondering, the two new characters are Luna Snow and Crescent from the Marvel Future Fight app. I don't think that's Wiccan, I think that's the new character Sword Master. Why have I not heard of this character before? You have failed me Scans Daily! Marvel seems pretty determined in pretending his redemption didn't happen. So this is a totally Asian team written by an Asian-American writer? I am really not sure how to feel about race-based products. I know, right? Seeing The Avengers (2012) on film was super weird. Right, more representation of PoC characters is definitely a good thing. That line would be roughly representational (using the CIA World Factbook for ethnic breakdowns in the US. This source doesn't list Latinos as a separate ethnicity because " US Census Bureau considers Hispanic to mean persons of Spanish/Hispanic/Latino origin including those of Mexican, Cuban, Puerto Rican, Dominican Republic, Spanish, and Central or South American origin living in the US who may be of any race or ethnic group (white, black, Asian, etc. ); an estimated 16.3% of the total US population is Hispanic as of 2010" but go ahead and assume that sixteen percent of the characters across the line are also of Hispanic descent) but it would certainly feel strange. I don't know. I'm less concerned about this book in particular than the general state that makes "And here's an all Asian characters book," feel like a somewhat clumsy attempt to fix Marvel's ongoing problems with representation. May this be more successful at sparking an ongoing than that Totally Awesome Hulk arc. There is a surprising lack of Japanese characters on the roster. I feel like Marvel has more Japanese heroes than South Korean, but I guess Pak wants to stick to what he's more familiar with, which I respect. "There is a surprising lack of Japanese characters on the roster." They were going to have Sunfire but he threw a tantrum and quit right after he joined. Is the Silver Samurai a good guy or a bad guy this week? The only other major Japanese heroes I can thing of are the Big Hero 6 and Marvel and Disney clearly have very different thoughts on what to do with that property. Nico is otherwise occupied and most of others are super obscure (who is Radiance?) or nonpowered ("knowing Wolverine" is not a super power) but am kicking myself for forgetting Jolt. She should have joined the Champions by now. Superpowers aren't required to be on a team. The people listed are not as obscure as many of the new members/characters on this team. Radiance has a cool backstory (and initially a cool costume), look her up. "Superpowers aren't required to be on a team. " True but I was specifically talking about Yukio and Amiko. Both of them seem out of place on a team. At best they're people who occasionally hang out with some X-Men. "The people listed are not as obscure as many of the new members/characters on this team"
C.B. Cebulski? Either way, that seems pretty obscure. And as much as I like it when Marvel uses classic New Warriors as something OTHER than punching bags, .... was either Turbo ever ANYONE's favorite? I did look up Radiance and I agree on the backstory ... though I must be looking at the wrong costumes. Yeah, I'm getting Netflix/Bendis Defenders vibes from this in that it seems like a fine collection of characters but -Jimmy aside- it isn't Agents of Atlas. This is an unrelated thing that they threw out so that could keep the name. 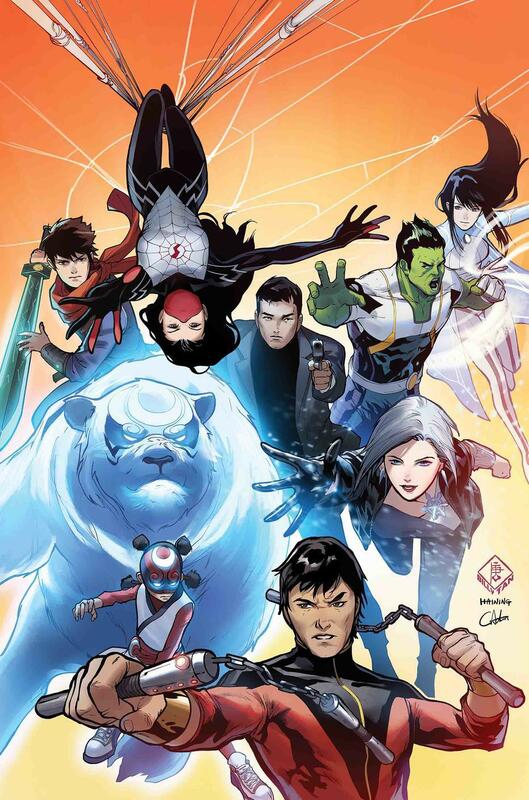 Also, why create an Asian super team and leave out Marvel's most popular Asian-American character? It isn't like the X-Books are interested in using Jubilee. Can someone explain to the youngsters WHY they were the Agents of Atlas, and why none of these are? Since we don't know why this team is using the name, that's a sort of redundant argument isn't it? Jimmy Woo's in the story, so they've probably got a legitimate claim to it. The company that would become Marvel comics called itself "Atlas Comics" in the 1950s. The Avengers were created in the 1960s. In the 1970s Marvel had a comic called "What if...?". The premise is self-explanatory. One of the earliest issues asked "What if the Avengers had been formed in the 50s". The lineup was made up of characters from that era. In the 2000s Marvel introduced a slightly tweaked version of the 50s Avengers into official continuity called the "Agents of Altas". It was one of those fun books that embraced the silliness of superhero comics. The fact that an Asian-American is writing this reassures me that this won't fall into the "all Asians are alike" trope. And they finally have a Filipina hero in Wave. Hopefully they'll actually do the research this time, not like the travesty that was the Triumph Division (though I did find it cool that their headquarters is my old university's chapel).